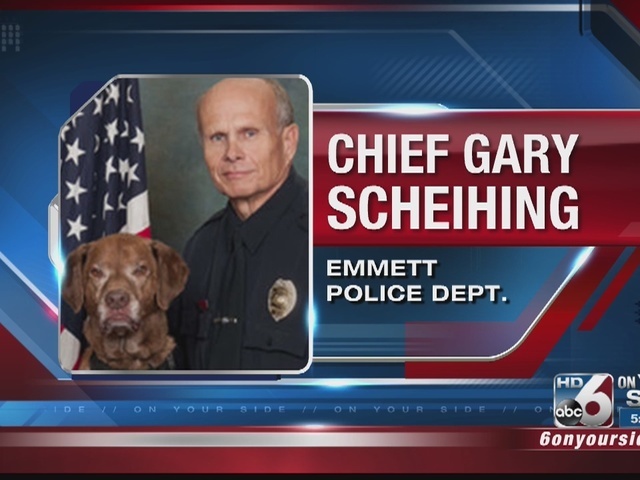 Emmett Police Chief Gary Sheihing and his K-9 police dog Roscoe were involved in an accident on Highway-16. The crash took place on Thursday afternoon at the intersection near S. Johns Avenue. The Idaho State Police say a Freightliner semi-truck pulling a trailer struck Sheihing's police cruiser. Both Chief Sheihing and the truck driver were wearing seat belts. Chief Sheihing to St. Alphonsus with non-life threatening injuries. Roscoe was taken to Gem Veterinary Clinic where the K-9 officer had to be euthanized after suffering a broken spine. Roscoe was surrounded by several law enforcement officers when he passed away. State Police will continue to investigate the cause of the crash.